There are many things about drawing that I like as well as a few that I could definitely do without. I feel that the toughest part of every drawing is getting started. I often find myself struggling to determine where and how to start each of my pieces. However, once I get going, I love getting lost in the process. Often times, I’ll be working on a drawing for hours and not realize how much time has past. Once I get in a groove, I find drawing to be very relaxing. Also, before taking this class, I used to struggle with the scale and relative sizes of the objects that I would draw. However, this part of the drawing process has become much easier for me due to the new techniques that I’ve learned in this class, such as using my pencil and my thumb as a sliding scale to measure objects’ sizes. I enjoyed drawing the still life works that we drew at the beginning of this semester more than I enjoyed the landscapes, and I believe that this is because of all of the minute details that are present in the landscapes. I’m very detail oriented and like everything to appear just as it is in real life, and it was difficult for me to try to move away from this way of thinking when drawing the objects in the backgrounds of the landscapes, which as discussed in class, should have less detail than the foreground in order to demonstrate that the objects are further away. Additionally, the vastness of the landscapes were slightly overwhelming as I started each project. Furthermore, my favorite part of the actual drawing process is shading. I believe that this is my favorite part because the shading is what really brings the work to life. It always amazes me how a little shading can make such a drastic difference and have such an impact on a drawing. 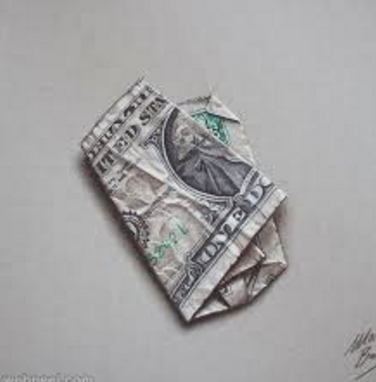 Finally, my favorite types of works of art are hyper realistic works. Although, often times, hyper realistic drawings don’t allow for as much creativity or the ability to tell a story or narrative, I believe that hyper realistic artists are among the most talented artists out there. Throughout my work, I always try to depict whatever I am drawing in a realistic manner, and I believe that hyper-realists have taken this goal to a new level. I admire the time, effort, and attention to the most minuscule details that must come along with being able to produce such realistic drawings. 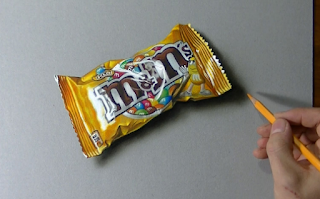 I have included a few of my favorite hyper realistic works below. 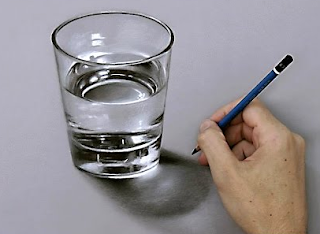 It never fails to amaze me that these are actually drawings and not real object. 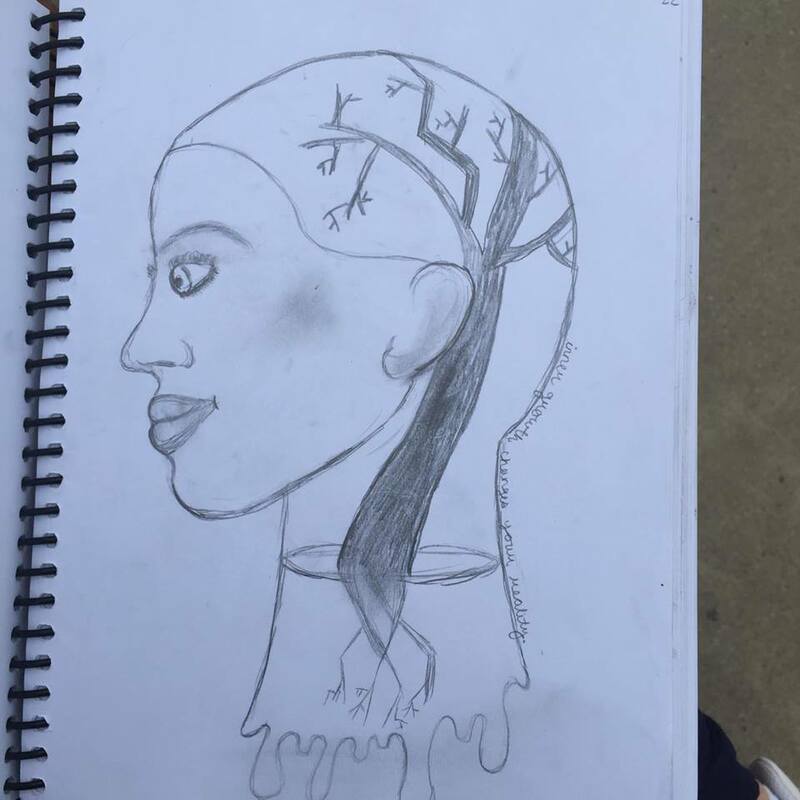 I have been drawing for a long time and am glad that I got the opportunity to draw in college. I hope to be able to continue to draw in the future as well. Drawing has always been something I deeply enjoyed. When I was younger, I remember anxiously changing out of my P.E. clothes, hoping to get up to Ms. Cirigliano's art studio as fast as possible. I remember the soft and sweet smelling ivory paper she gave us to draw on. It actually was more yellow than ivory. It wasn't smooth, but it was so soft--it felt like a mandolin slice of a cashmere sweater. We had wooden blocks with twelve shallow, little holes to support the 12 Magic Markers pegged into the wood--each stood up a little crookedly. We always got to draw after clean up and before our homeroom teacher picked us up from Ms. Cirigliano’s. This was the best time. Dulled edges of these over used markers bled, sometimes rich, sometimes dry, ink into the cashmere paper. Swirls and strokes of these 12 pegs made some beautiful creations of fantasies that my little mind cooked up. With immense pride I would inscribe “To: MoMmy” to bring them home as gifts. When I was a foot older, I remember being sat at dinner next to one of my mother’s insanely cool clients. At this age I did not know the difference between clients and friends, so I was immediately comfortable with her, “knowing” she was a beloved “friend” of my mothers. She was a fashion designer with a collection coming out in the spring. She was from Italy, but she was accent less. Tall and slender with a “boy” haircut she was the definition of chic. I remember she pulled out a cocktail napkin and a pen from her bag and taught me how to draw a fashion figure. 9 heads, shoulders and hips bent, long eyelashes, with broad shoulders. She handed me the pen and on my marinara stained napkin I was initiated into what would become an obsession. She gushed at what I assume were pitiful attempts, but nevertheless her instructions were carved into my brain. I bought books and watched videos, my goal was to practice always and perfect the illustration of the illustrious fashion figure. As childhood obsession do, eventually mine diminished. However, I still doodled the 9 heads in the loose-leaf present mindlessness that often was school. 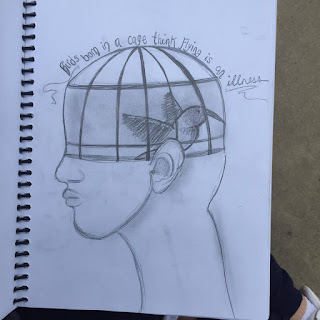 From 6th grade until my freshman year of college this was as deep as my involvement in art went. While utility was definitely absorbed from my margin drawings, by the time I was a freshman here at Duke I needed more. Last year, I started really focusing on my 9 heads—practicing, planning, and completing colorful and clean lined outfits, all in “trend” for fall 2015. Maybe it was because I got no fulfillment from giant lectures? Or maybe I was just bored? The obsession resurfaced in the form of Amazon Prime shipments of hundreds of different colored markers and pencils. I found myself hunched over, careening neon pink markers through smooth, cold printer paper. It was incredibly cathartic—a way to block out the noise that was my freshman year mind. That was my roommate. I was drawing all the time, and I was getting good. By Spring semester I wanted to be more formally trained in drawing, I wanted to understand perspective, understand depth, understand texture. I promised myself, with help of goading from my peers, to take Drawing 101. So that I did. At first I was astonished at my inability to understand sharp and straight lines, my mental block and confusion to processing the morphology of wooden boxes and mannequin legs. I was so used to curves and the asymmetry of the human body. I was used to imperfection and eraser marks. 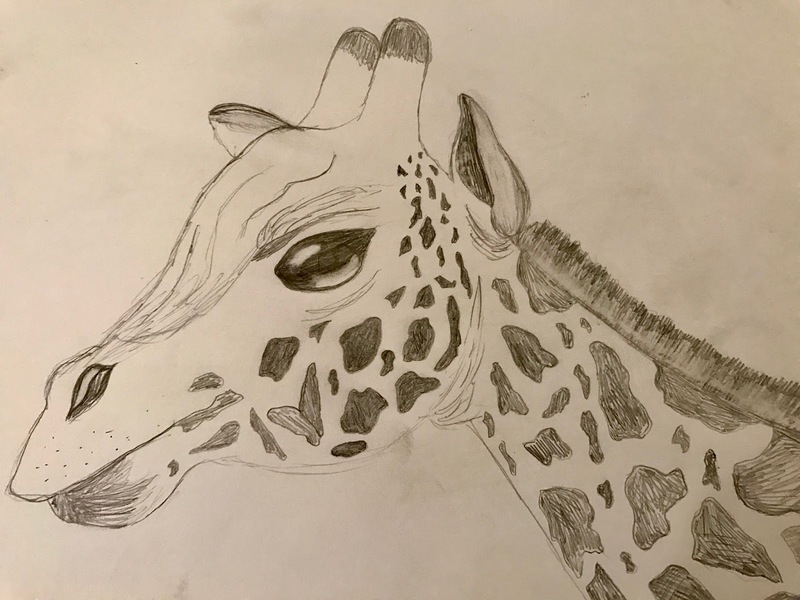 Aside from feelings of pressure for “perfect” drawings, there were so many questions that muddled my understanding of drawing and undermined my confidence as an artist. I have to consider light? Perspective? I have to hold my pencil out and twist it to understand angles? How do I shade? Why is charcoal so messy? What I thought would be a class that would continue to provide the cathartic support I got from drawing in my dorm, was actually giving me a little anxiety! But with practice, guidance, and time my aversion to drawing still-life, architecture, and furniture became a lot less daunting. And with more free-form assignments I was able to dabble in my preferred drawing of human figures and clothing, but paired with realistic backgrounds and props. I definitely have grown immensely as an artist and drawer this semester. I have found my strengths and weaknesses, and have found an incredible sense of peace while doing so. Drawing has provided a sense of fulfillment and therapy that could be achieved through nothing else, and for that I am extremely grateful. As a person who loves artwork, appreciates creativity, and spends endless hours painting - had you told me a drawing class would give me anxiety - I would have laughed. 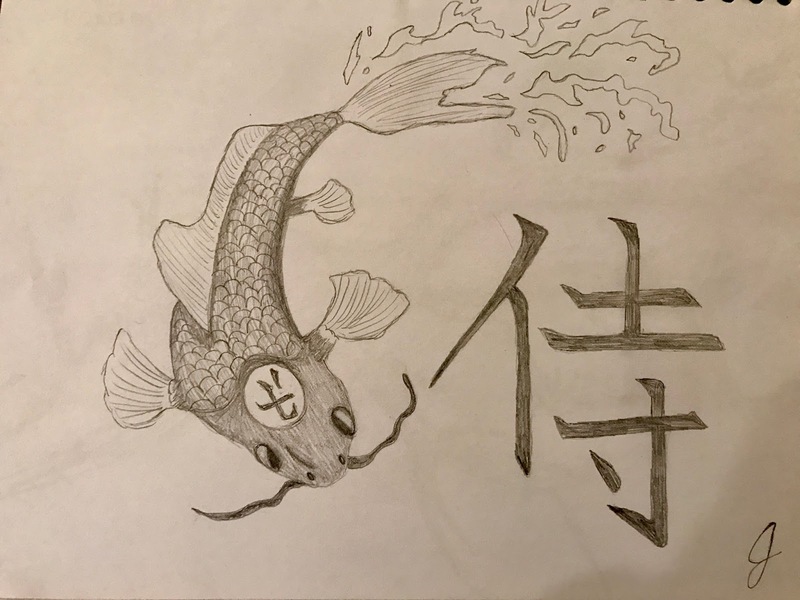 Considering the fact that I have done several projects before, I would never have thought I would have been so anxious when it came to drawing. I originally decided to take this course because, given my love of art, I wanted to take an art course at some point in my Duke career. My decision of a drawing course specifically stemmed from the fact that I already love to paint. I wanted to understand the stylistic techniques of drawings in order to gain a background in sketching, in order to improve my paintings and to foster a basic drawing skill which I did not believe I had. 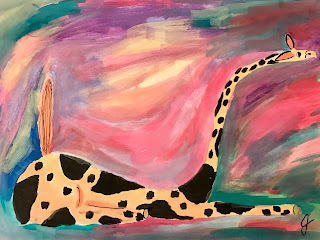 When I use the word anxiety - this is not necessarily in the negative sense, rather simply as an observation of my personal reaction to an art-based class. 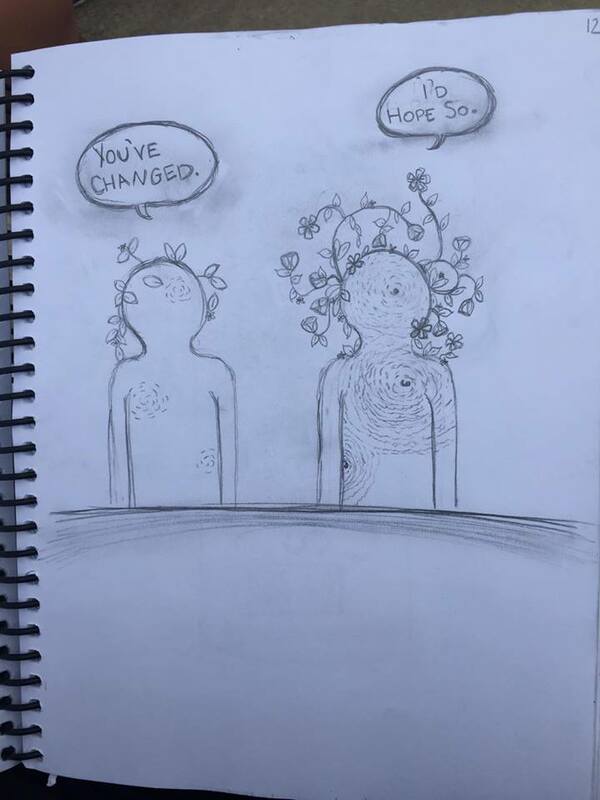 This “anxiety" pushed me out of my comfort zone in a way that taught me several things about myself and the practice of drawing. So - you might ask, where did my anxiety stem from? Well, for one: the length of the process of drawing. This semester I couldn’t just ‘do the assignment’ the night before. I needed to prepare a time for myself, generally several times, where I could sit and really work on my drawings. 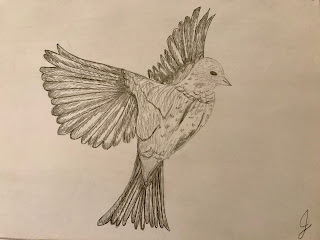 I had to make the time to do the study drawing, to analyze where I could improve, to work on the final, and then to make the edits I felt were necessary before I could submit my piece. This lengthy process also came with the cost of location - I didn’t want to carry my drawing board to every place I went to study, so I really needed to dedicate hours to a location and to the task of drawing. This was particularly difficult for my in the empirical drawing - spending hours on the floor of the library rather than in my standard drawing location of my apartment. Reason number two came from the difficulty in seeing perspective. My brain and my eyes have definitely had their fair share of differences when it came to creating works for this course. I have really tried to draw exactly what I see, and somehow my brain, what I know exists, has come to take over what comes onto my paper. That said, it is for that reason that I particularly enjoyed shading - while my line-work had difficulty deciphering between information coming from my brain and eyes, I enjoyed working with the different pigments that the pencils were capable of producing. I felt that I had the opportunity to add elements of depth to my pages without necessarily creating those with structured lines. The topic of shading also most reminded me of painting - even though it was all still grey-black, the option to choose the depth and strength of the color was one that i appreciated. Reason three came from my comparison of my work to other’s. From this process, I have come to conclude that my talent is not in drawing realistic images. There are people in the course who have created masterpieces, and have a deep passion and love for drawing realistic images. While I appreciate their works, I felt embarrassed for my work to be placed next to theirs. I felt that my work was unworthy of being placed next to such works of art - and this is something I found difficult to overcome. However, from this experience I realize that have grown to have an appreciation for the artwork that others have produced in a way that I have yet to experience. Even though I have produced artwork in the past, I have never taken a course in the topic, and I wholeheartedly believe that the countless hours with my pencils, paper, and erasers have more deeply developed my appreciation of art and detail. Overall, I have really appreciated what I have learned in this course, and am very glad to have taken it as one of my last courses here at Duke. I definitely see a drastic difference in the works I have produced and the way I see lines and objects in spaces. I really do believe that I have improved over the course of the semester. That said, for me, I have come to understand that my handiwork in realistic imagery is still at the 101 level. While I definitely have an interest in continuing to improve in that sense, I am excited to explore the opportunity to sketch more abstract works! In addition: I have included some of my favorite sketchbook drawings below! Thanks again for a wonderful semester! I never considered myself to be a very talented artist, however I have always loved making mandala/ tribal style doodles and prints. I took this class because I wanted to expand my abilities and experience. Unfortunately, I did not expect the process to be such a struggle. This drawing class has been a challenge to say the least. I can definitely see improvement in my work, but it did not come easy. I had to spend much more time than I had anticipated in order to make my pieces cohesive and carefully drawn. One thing I wish had been more heavily emphasized in class was techniques or how to’s for those who had relatively little experience. 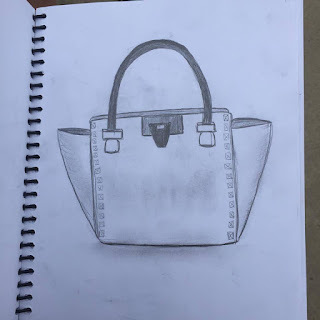 I know instructing drawing is difficult because everyone has their own style and it can’t be “taught” per se, but I think more instruction during the initial part of the class would have been helpful. However, I did like the process of doing a study drawing one week and then receiving feedback the second week. I think it helped everyone to refine their ideas and help with questions or gaps they might be having in the process. I also enjoyed seeing the unfinished versions of my peers. Overall, I am happy I took the class because I have a newfound appreciation for the skill it takes to create realistic drawings. Some of the pieces my classmates have drawn just amaze me, especially now that I actually understand the process an artist goes through in order to produce that piece. 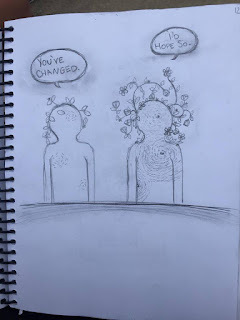 Sometimes I look at the drawings and I actively feel like I’m experiencing the scene; that is something I didn’t really feel before this class. Ever since I can remember I've had a passion for creating. Typically, my creativity has spawned into music, painting, screen printing, or random arts & crafts projects impulsively tackled on a rainy day or weekend. ARTSVIS 199, however, changed that. Before this course, I had never imagined that I'd spend so much time on solely drawing with a pencil and paper. Sure whenever I painted I would sketch beforehand but I always viewed this as fast, extraneous art merely supplementary to my final piece. 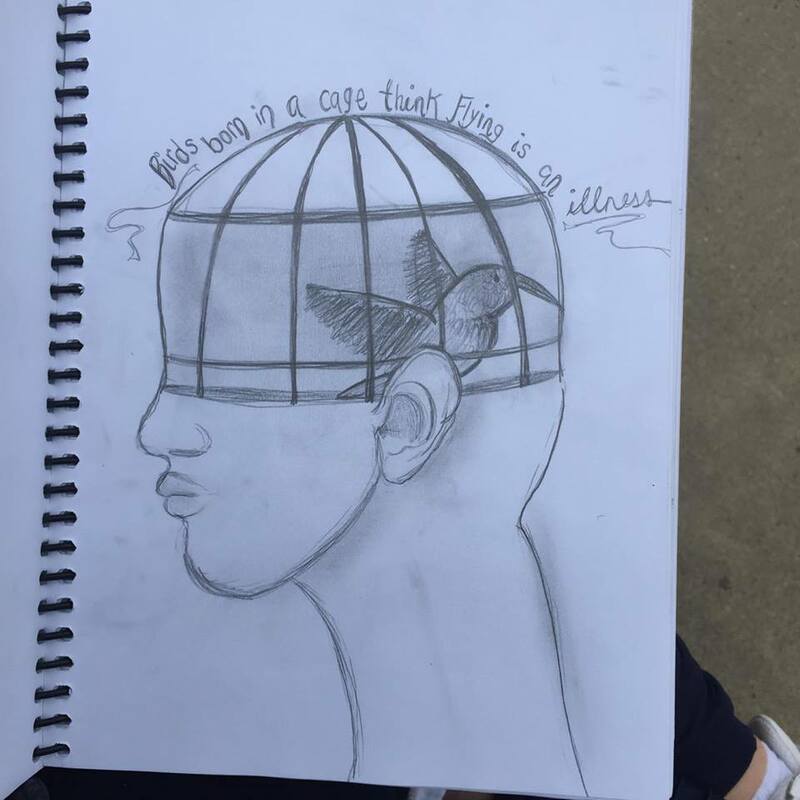 As my first art class ever, ARTSVIS 199 served as an eyeopening introduction into what other forms of creating I could do. Even though I am still very new to drawing, I found that I could manipulate my pencils, charcoals, and erasers in ways that had never even crossed my mind before. Above are a few of my pieces from my sketchbook from this year. From looking back upon these works, I realize I am appreciative of how I can take a photograph, memory, or even an idea and turn it into something that's malleable and palpable through drawing. The fourth picture from the top, for example, represents a picture that I took while on a road trip during my semester abroad in New Zealand. While my drawing doesn't have each tussock carefully depicted, it is as a whole truly representative of the landscape. I also have found that because drawing is something that is created and therefore manipulated, it is possible to input emotion or even a feeling into a piece. By reassessing my New Zealand landscape photo, I can see that I somewhat subconsciously drew the road so that it appears almost as if it is a stream. While this can undoubtedly be attributed to my beginner status as a drawer, it can also be ascribed to the feeling that I have when I look back upon this particular photograph. 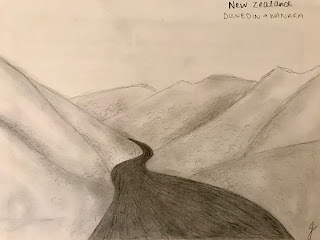 At this time, I felt as though I was floating down a river towards the unknown in New Zealand and this narrative of exploration was able to be conveyed to my audience because of my drawing technique. The last photo that I included above is representative of how I hope to meld my newfound passion for drawing with my past artistic interests. While it is no doubt one of my less technical pieces, it is indicative of how I hope to blend drawing, painting, and creativity. 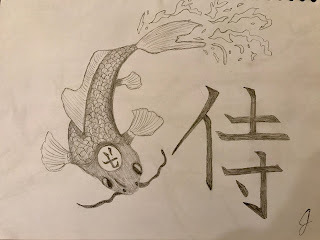 In the future, I plan to continue drawing and I plan to use painting, screen printing, watercoloring, and more to help bring my creations to life. I have always had a passion for art, whether it was photography, drawing, collage, or painting. From a young age, I would doodle, make messy watercolor drawings, and create small Play-doh “sculptures”. I began taking art classes around age 8, and continued (though I switched teachers three times) until my senior year of high school. I even considered attending the Rhode Island School of Design (RISD). However, I came to Duke because I wanted to study more than just art, and explore its interconnections with a variety of other fields. Art is my escape from the world around me, and I know I will pursue it in some form for the rest of my life. This class has surprised me in many ways. Firstly, I didn’t expect to spend this much time simply talking about our work. I usually see drawing as an individual process, not really a group discussion. However, this format really opened my eyes to the value of group critique, and I enjoyed hearing about other people’s struggles, processes, and techniques while sharing my own. Another thing that surprised me was how quickly the class picked up. Admittedly, on the first day, I thought the class would be a little slow-paced. However, after a few weeks, the techniques and assignments picked up, and I was genuinely challenged by some projects. I have never really done empirical perspective, negative space drawings, or fantasy drawings of this scale. I think I learned a lot from this class, since I was trying out new subject material in ways I had not before. Drawing on 18” x 24” paper challenged me, and I learned a lot from listening to the drawing discussions of my peers and exploring new subject matters. I also enjoyed that the class was connected to other arts events, such as meeting Mexican artist Sergio Santamaría. I absolutely loved his work, and gained a lot of value from visiting his gallery. 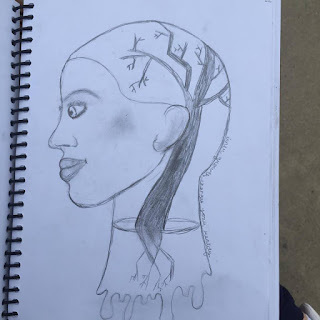 I also liked the trip to the Nasher and drawing outdoors. I am incredibly sad that this class does not count towards my Visual Arts minor (it really should!) but I am definitely glad I took Drawing. It was my favorite class of the semester, and even the assignments didn’t feel like daunting tasks. Instead, they were a way for me to relax and get my mind off my other homework.